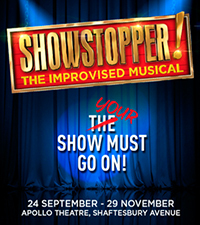 The beauty of improvised musical show The Showstoppers is that you can go as many times as you want as they make it up fresh for every performance. So even though I saw two performances on their press day last week, I was more than happy to go again this Sunday evening, this time to experience the delights of Jim’s Soggy Bottom. A tale of love and Russian politics in the Bake-Off tent with numbers in the style of The Boy From Oz, Sweeney Todd, Urinetown and Jesus Christ Superstar among others, it was highly entertaining as always. Ruth Bratt continues to be a hoot but Pippa Evans has been in a real rich vein of form recently to nab MVP for me. Worth a trip if you’ve not been yet and worth a revisit if you have! It’s perhaps a sign of the times that an element of variety has crept into theatreland. Where the West End is usually dominated by plays and musicals, we’ve seen the likes of Vegas-style revues like Sinatra and magic shows like Impossible extend its entertainment remit and now we can add improv shows to the list and not only that, improvised musicals. 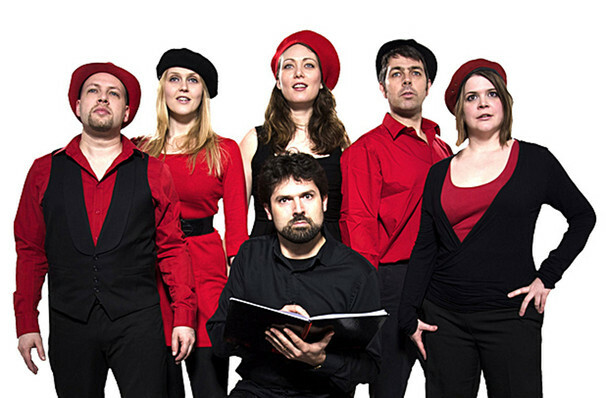 Created by Adam Meggido and Dylan Emery, The Showstoppers have been making up musicals on the spot for eight years now, regulars in Edinburgh and smaller venues like the King’s Head and the Charing Cross Theatre but they’ve now made the significant leap to the Apollo on Shaftesbury Avenue. A first trip back in ages to Showstopper and instant regret that I’d left it this long. I think perhaps I saw them too many times too close together so I took them for granted but regardless, their brief engagement on the South Bank ahead of an Edinburgh run enabled me to rectify this. The Showstopper company are an improv group who specialise in making up musicals on the spot, taking audience suggestions for titles, musical theatre styles and random plot points and somehow weaving them together into comedy gold. Tonight’s show was GunWharf Souk, set in 1945 the long-established Little Morocco area of Portsmouth, where sailors on shore leave find their heart captured by the locals even though their warship is waiting to take them back to the Pacific. As with much comedy, you kinda need to be there to hear how funny it is and I can assure you that it is quite simply hilarious to watch these talented performers (Ruth Bratt is a comedy genius, Pippa Evans also brilliant too) improvise so randomly and expertly from love songs to Lloyd-Webber, Sondheim to (Gilbert &) Sullivan.